Microphones not only pick up the sound floating through the air, they also transfer sound from things that they physically touch. This means noises when you bump your camera, motor noises, pressing buttons on your camera, etc. A way to minimize this is by the use of a Shockmount. 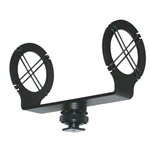 A microphone shockmount works the same way shock absorbers do. They allow the shotgun microphone to pick up only the noises that you want to be recorded. Item Reviewed: Shockmounts 9 out of 10 based on 10 ratings. 9 user reviews.